Cyborg Dragons Plaque  - $62.99 : Mystic Crypt, the most unique, hard to find items at ghoulishly great prices! 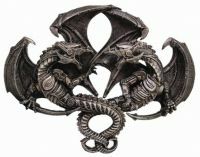 Cyborg Dragons Plaque. Dueling Dragons Mechanical Looking Cyborg Plaque. This piece will hang on your wall and has awesome detail. Measures 9 3/4 inches in height, by 13 inches wide, by 2 3/4 inches in depth. This statue is meticulously crafted from cold cast resin and hand painted. Great for any dragon collector.